SUMMER NIGHTS. Say what you want about our cold, dark, never ending winters, but you simply can’t beat Swedish summer! These long, warm, bright days that never seem to turn into night is what makes me survive the long cold winters. The fact that summer is only here for such a short time makes it even more special. Last night was one of those magical Swedish summer nights when the sun doesn’t want to go to bed, so I decided to throw on one of my most treasured dresses by swedish designer Ida Sjöstedt. I managed to snag one of the last pieces over at 30 Cancan (who by the way have a great selection of Swedish designers), and it’s everything I hoped for and more. You can’t really see the delicate detailing on these pictures, but close up it’s breathtakingly beautiful! 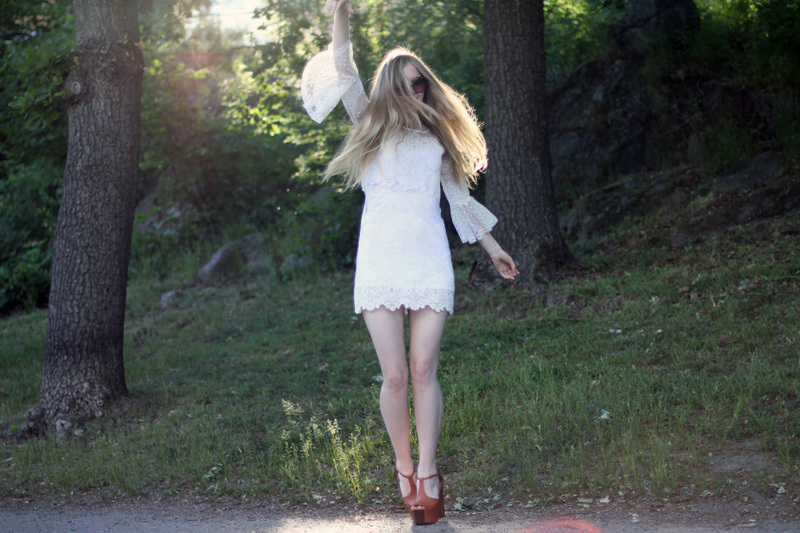 Ida Sjöstedt lace dress. Jessica Simpson platforms. Botkier bag. Pucci Sunnies. really really love that dresss ! and love your shoes with it! Everything, the shoes, the dress, the hair and the sunglasses, they go all together so well like a perfect puzzle piece. During nights like these you wish you didn’t have to sleep for a week)) Loved the Swedish propaganda part! I might go to Sweden this month, so it was a very interesting to read. And it’s a beautiful dress, so delicate. I love your dress! I’ve been looking for similar dress a while. The dress is absolutely breathtaking and matches perfectly with Jessica Simpsons’ sandals! I am going nuts for those Pucci sunglasses! I went to Stockholm some summers ago and I was soooo fascinated by everything! def wanna go back there as soon as possible! Wouhaouuu! This pictures of you are so gorgeous…And this dress is fabulous! love your animation type images. very cool my lady. Oh my gosh! Your dress is so beautiful…! probably the most amazing sun glasses i’ve ever seen! Great dress…it is fantastic!!! I like it!!! You are a very beautiful girl!!! I really love your bag and your sunglasses are amazing! So simple and pretty ! I want the same outfit !!!!! håller med. just att det är så kallt o regnigt/snöigt så mycket gör att man verkligen njuter när solen och värmen är här! That dress is absolutely stunning!!! And those sunglasses! Love! Just stunning and this dress is beautiful!! Love, love, love lace. I love to combine romantic lacy dresses or shirts with leather jackets or tough jeans and boots! Dandelions have always been my favourite flower, this pic is so lovely!! :) And that dress is absolutely beautiful, you look great! The Cherry Blossom Girl just posted on her blog the same outfit: same dress and shoes! this dress is true lace perfection. You are absolutely FABULOUS!!! Love this look so so much and the first moving pic is awesome! u look so adorable, carolina !! love ur lace dress !! Just stumbled across your blog! Love the pictures, you look beautiful and the lighting is perfect! Of course, my favorite is the first moving picture. I look forward to continuing to follow your posts. Lace, white and Spring-time. I hope it doesn’t end! What a lovely, romantic dress! You look remarkable. you look absolutely beautiful, from what detailing i can see on the dress its damn emaculate, and you paired it so well with the bag and the shoes! If I have the chance to visit sweden, I’ll remember to make it a point to go in summer! Your dress is so pretty, loving the lace details!! omg this post is just so beautiful! the pictures are just perfect and so is your outfit! Wow I just I absolutely love these photos. you look amazing! so in love with your dress! Beautiful…Summer really is special, i agree! Loving the dress and the sunglasses! I am in LOVE with lace dresses recently , I just bought one very similar to yours some days ago and I wore it last night <3 ! I like the way you matched it with those heels and black bag . you’re wearing the exact same thing as Alix too! Lovely dress ! I like how you and Alix wore them in a slightly different way. oooohhhh carolina. best outfit of today! hippie meets 21 century. i love it. Such a cute dress and I love the animated pic–adorable! Lovely. I agree the fact that the summer is short makes me embrace it that much more. The combination of laces in this dress is perfect. So romantic. I love the first photo! Your sunglasses are impressive! Love these photos, you look wonderful!!! Stunning dress, just fell in love with it! Wauuuuuw, this look is amazing! I def could not pull off those sunglasses but you do perfectly!! Channeling 70s goddess! What a beautiful pictorial! this is just adorable!!! absolutely love this. OMG! u’re a dream! That lace dress is adorable and those sunglasses are so cool! That dress is truly incredible, it really is beautiful! I like your shoes as well they look so nice! Everyone seems to always manage to wear high heels all the time yet I never do, hehe! But the dress is definitely beautiful I’m so keeping my eye out for more stuff by her! The first picture moves! So beautiful!! Fantastic Pucci Sunnies & sky high platforms! How cute are you?! Ha ha Love the changing photo! You are so beautiful! love these photos the dress is beautiful!! I have fallen in love with your dress. It is amazing. and book a ticket after all this advertising. Amazing!! :) I love the dress!! Gorgeous dress. Love the platforms too, killer. That lace dress is magical. I wish I can find something comparable to that here in LA. ~Such a gorgeous dress! And those sunnies are pretty amazing as well. OMG! this is a very special dress, formidable! in love with it! Nice girl and nice dress. Beautiful dress on beautiful girl. Look at my fashion auctions site to see more beautiful things!